While many are aware and have heard of the term “Black Friday”, few know what it really means. Black Friday is the name given to the shopping day after Thanksgiving. Believe it or not, Black Friday was originally a negative connotation coined by the Chicago Police Department to describe the mayhem surrounding the congestion of pedestrian and auto traffic in the City centre. So many people went out to shop it caused traffic accidents and sometimes even violence. So, how did Black Friday position itself positively, and how does it actually effect retailers & the economy? Retailers did not appreciate the negative connotation associated with a Black day of the week. They had a good point. A negative association with the date was directly correlated to a drop in the economy; when Black Monday was declared on October 19, 1987, the Dow Jones Average fell 22%, the largest percentage drop on one day in stock market history. Retailers decided to give the name a positive spin and turn what could be a harmful situation on the economy, to a positive one. After all, Black Friday, the day after Thanksgiving is a very profitable day. They used the name to reflect their success. Accountants use Black to signify profit when recording each day’s book entries. Red is used to mean loss. Therefore, Black Friday means profitable Friday to retailing and to the economy. It’s undeniable that this is one of the most important retail days of the year and technology has greatly helped improve the way consumers react more each year. With the advancement of e-commerce platforms, retailers can now benefit from the increase in profits without having to manage additional physical footfall & mayhem; sales still increase & consumers are able to make purchases from the comfort of their homes/offices without having to step foot outside. According to Accounting Degree, total spending on this day is increasing rapidly due to online spending and other days that follow such as “Cyber Monday”. Cyber Monday (Nov. 26) much like Black Friday, is a marketing term used to describe the Monday directly following Black Friday, generally when the greatest online deals are available. The term made its debut on November 28, 2005 in a Shop.org press release entitled “‘Cyber Monday Quickly Becoming One of the Biggest Online Shopping Days of the Year”. Retailers are learning every year that they need to be ahead of the curve when it comes to Black Friday & many of these brands are doing so by extending their sales out further, especially in the UK. With major high-street and luxury brands embracing the American culture of Black Friday and utilising its popularity to push pre-Christmas sales. There has been a massive increase this year alone, with companies advertising the fact that their sales are available both online & in store, some even leaking their Black Friday deals specifically to major blogs & discount groups in order to ensure that people will be on their websites at specific times & waiting for their store doors to open. Some brands including “Apple” are even teasing consumers with newsletters merely mentioning that they are going to be putting on deals in order to ensure that there is a queue both outside their main stores (especially the one by our office in Oxford Circus) and online at 9am tomorrow when prices may or may not be reduced. Black Friday truly is a clever and well thought out marketing campaign by retailers, utilising generations that are cash rich but time poor to ensure that they still fuel income streams. 3. 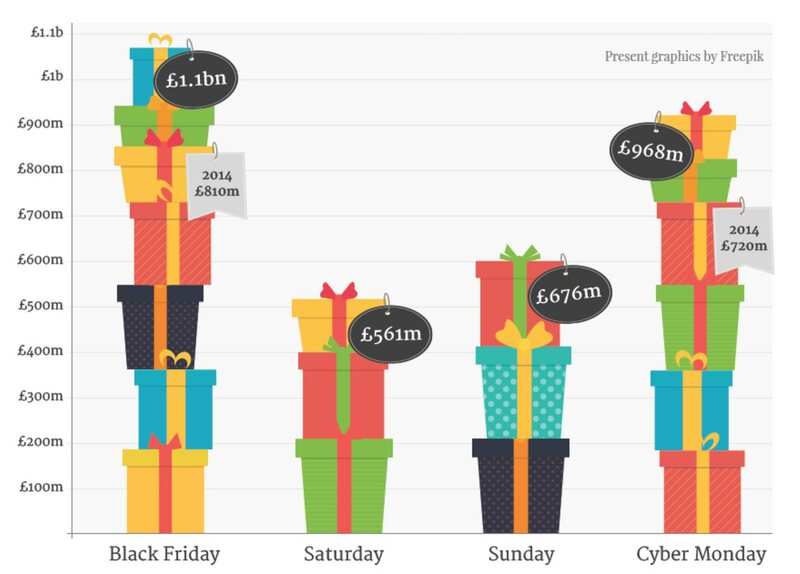 It is estimated that the average spend will hit £203 per person on Black Friday – double that of 2015.